I’ve just met four great startups in the last three days. 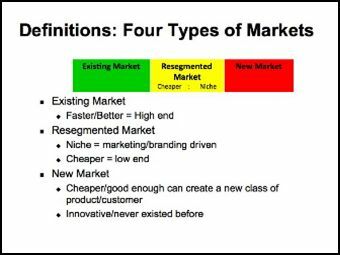 All four were trying to resegment an “Existing Market.” An existing market is one where competitors have a profitable business selling to customers who can name the market and can tell you about the features that matter to them. Resegmentation means these startups are trying to lure some of the current or potential customers away from incumbents by either offering a lower cost product, or by offering features that appealed to a specific niche or subset of the existing users. Me – “Have you used Company x’s product? Do you know have they distribute their product? Do you know how they create demand? Do you know how many units they are selling? Do you know the archetype of their customers? Rule 1: In an existing market Customer Development means not only understanding potential customers, but your competitors in detail – their product features, their sales channels, their demand creation strategy, their business model, etc. Me –“That’s a great hypothesis, do customers tell you that they’d buy your version if it was cheaper or on the web? Rule 2: In an existing market Customer Development means understanding whether your hypothesis of why customers will buy match reality. This is easy to test. Do this before you write code you may end up throwing away. Rule 4: You may want to think twice positioning as a New Market. If customers immediately get an analogy for your product, don’t dissuade them. Save the “New Billion Dollar Market” positioning for the investors, not customers. When I was a young marketer I learned how to listen to customers by making a fool of myself. Twenty eight years ago I was the bright, young, eager product marketing manager called out to the field to support sales by explaining the technical details of Convergent Technologies products to potential customers. Convergent’s business was selling desktop computers (with our own operating system and office applications) to other computer manufacturers – most of them long gone: Burroughs, Prime, Monroe Data Systems, ADP, Mohawk, Gould, NCR, 4-Phase, AT&T. These companies would take our computers and put their name on them and resell them to their customers. Business customers were starting to ask for “office automation solutions” – word processing, spreadsheets, graphing software on a desktop. This was just before the IBM PC hit the desktop so there were no “standard” operating systems or applications for desktop platforms. Computer hardware companies were faced with their customers asking for low-cost (relatively) desktop computers they had no experience in building. Their engineering teams didn’t have the expertise using off-the-shelf microprocessors (back then “real” computer companies designed their own instruction sets and operating systems.) They couldn’t keep up with the fast product development times that were enabled by using standard microprocessors. So their management teams were insisting that they OEM (buy from someone else) these products. Convergent Technologies was one of those OEM suppliers. I was traveling with the regional sales manager who had called on these companies, gotten them interested and now needed someone from the factory to provide technical details and answer questions about how the product could be configured and customized. As the eager young marketer on my first sales call, as soon as we shook hands I was in front of the room pitching our product and technical features. I knew everything about our operating system, hardware and applications – and I was going to prove it. I talked all about how great the new products were and went into excruciating detail on our hardware and operating system and explained why no one other than our company could build something so brilliantly designed. (This being presented to another company’s proud engineering team who was being forced to buy product from us because they couldn’t build their own in time.) After I sat down I was convinced the only logical conclusion was for the customer to tell us how many they wanted to buy. The result wasn’t what I expected. The customers didn’t act particularly excited about the product and how brilliantly I presented it. I do believe some actually rolled their eyes. They looked at their watches, gave our sales guy a quizzical look and left. The next day, as I drove to our next meeting the sales guy was intently reading the sports section of the newspaper and as I glanced over he seemed to be writing down the scores. I wondered if he had a bookie. When we got to the meeting he reminded me to be quiet and follow his lead. The engineers spoke about all the pressure they were getting from management to build desktop personal computers rather than their traditional minicomputers. And that their management wanted these new systems on a schedule that was impossible to meet. Then our sales guy says something that makes me stop breathing for a while. “I bet if your management team would give you guys the resources you guys could build desktop computers better than anyone, even better than us.” There’s a unanimous agreement around the table about how great they were and how bad management was. I had just watched a master of the consultative sale. I thought (and still do) that this sales guy walked on water. He had spent 12 years at DEC, first as a hardware engineer designing part of the PDP-16, then as the marketing manager for the LSI-11 and then into sales. Making sales calls with him taught me what a world class salesperson was like. It also made me understand what kind of support sales people needed from marketing and what marketing programs were wasted motion. It also made me realize that there are times you don’t want any sales people in your company. If you read this post you can come away with the impression that every startup with a direct salesforce needs a consultative sales team. Not true. which step in the Customer Development process are you on? what Market Type is your startup? If you’ve just started your company you are in customer discovery. 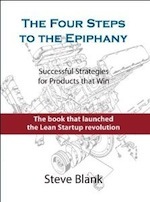 If you’ve tried to slog your way through my book on Customer Development you know that I’m insistent that the founders need to be the ones getting outside the building (physically or virtually) to validate all the initial hypotheses of the business model and product. If you hire a VP of Sales with the idea that they can do customer discovery you violated the first principle of Customer Development – this isn’t a step the can be outsourced to a non-founder. Hiring a VP of Sales in customer discovery typically sets a startup back. It’s only after you’re done with customer discovery and are in the final steps of customer validation (building a repeatable and scalable sales process) that you start hiring a sales executive. The next thing you need to do is match your sales team with your market type. If you remember from a previous post, startups fall into four Types of Markets. You need to hire the right type of sales people for the type of market. If you are in a New Market, (delivering what Clayton Christensen calls disruptive innovation) the market doesn’t even have a name and customers have no clue on how your product works or how it could help them. This market cries out for a sales force that can help educate and guide the market to making the right choices. Your sales team is an extension of your marketing department. The same is true if you are in an existing marketing and trying to sell to a niche or a segment of the market based on your knowledge of their particular needs. Both New Markets and Resegmented Niche Markets required a skilled consultative sales force. This is very different from the sales team you would hire to sell in an existing market or a cheaper product. If you’re in an existing market and you have a superior product, by all means tout your features and specifications. However, your product itself will be doing a lot of the selling. If it is demonstrably better as you claim your marketing department needs to communicate that competitive advantage and your sales curve should look linear as you take share from the existing incumbents. If you are resegmenting an existing market a product with a cheaper alternative, by all means tout your price. Your marketing department should be all over this. In both cases you really don’t need a skilled/consultative sales force. A sales team with a great rolodex will do. Eric Ries of Lean Startup fame and the author of the Lessons Learned blog joined me at Startup2Startup for a joint Customer Development talk. Thanks to Dave McClure and Leonard Speiser for the opportunity to speak. 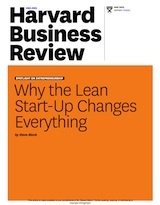 If you’ve never seen Eric’s Lean Startup presentation, take a few minutes to at least watch his part. It starts at ~40:30 in the video. A week before I started I got inkling of really how deep I was in. While I was waiting in the lobby to pick up my offer letter, the head of marketing communications (who was to be one of my direct reports) came up to me as I held my just signed employment agreement. She said, “Oh I’m glad you’re coming, and I wanted to grab you before you started because we need to resolve the company’s biggest marketing problem.” I was impressed; this was something so important that she couldn’t wait for my first day. Was she going to propose a coherent communications strategy? An in-depth reseller survey? Or offer some real insights into our customers? No. “We need to decide immediately between which version of the new logo to use.” Ignoring my dropping jaw, she pointed out the key differences in the Pantone colors between what appeared to me to be the two indistinguishable alternatives. Coming out of the fog at the sound of serious dollars about to be spent, I politely suggested that the new collateral was on-hold, and we were going to spend the first few weeks of my tenure trying to understand who our customers were, and what we wanted to say to them. And I hadn’t even started work yet. My first day at work I found myself staring at a set of marketing faces, mostly holdovers from the previous version of the company that had gone belly up, some were bright and eager, some clearly hostile. “OK, let’s start with the basics, who does marketing think our customers are?” We went around the room and every one of them had an opinion. Unfortunately, all their answers were different. Why did I ask these questions? As a company with a past history, the company had a massive advantage over a typical startup – it had customers. 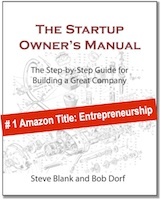 Normally in a startup you spend an inordinate amount of time and energy in Customer Discovery and Customer Validation. Yet here was a “restart” with over 15,000 customers who by putting their money on the table had personally validated the market. Now I was cognizant I might find a customers that hated the products or company. Or I might have found that the company was in a business that wasn’t profitable and no way to get profitable (which I had concluded was the case with their commodity disk drive business.) But this was an opportunity that needed to start with customer facts, and I was going to get them. Three hours later I had made up a three-page customer questionnaire. I wanted to know some simple and not so simple things about our customers. The obvious one’s were who were they? What did they do that they needed an expensive color graphics card? If you believed the opinions in the marketing department, the customers were in science, engineering, color desktop publishing, and a variety of applications with no single industry or application dominating the list. I wanted to know the facts. Within these applications how did our customers spend their day? Were our products a small part of their life or large? And since the card was useless without any application software, what other software products did they use on it? How important was the card to them getting their own job done? What was the most important attribute about our graphics cards and monitors that made them buy it? And by the way since we sold both the graphics card and a big screen color monitor did they buy both from us? Did their choice of the card affect the choice of who they bought the monitor from or vice versa? I also wanted to know if the marketing our company had been doing to date was effective. So I asked a set of questions about how customers had heard about our company. Do they know anything about us? What did they think we stood for? What did they know about our products? If they had they heard anything about us where did they hear it? I also wanted to know who our existing customers thought we competed with. While I could have told them, it was more valuable hearing their perspective. Had they heard about our competitors and their products? If so, where? Who did they think were the leaders in the color graphics board and monitor market? Why? What did they think the leaders most important attributes were? Since this was the marketing department, I was going to be planning to spend some advertising and public relations dollars. It would be great to know how they got news and information about new products and new companies. What magazines did they read? What reviews did they trust? Did they attend trade shows? Which ones? Had they seen any our ads? Did they understand them? Had they read any stories about us? I wanted to know if marketing was getting any bang-for-the-buck in spending its demand creation dollars. I wanted to understand how customers bought our products. I knew we were selling through a multi-level indirect sales channel. That’s a mouthful to say that our sales people didn’t sell our products directly to a customer. Instead they managed rep firms (independent sales companies that carried multiple, non-competing products) that called on computer resellers that sold to the customers. Since we weren’t talking to our customers directly I wanted to know if the message we were giving our sales people were coming out the other end. Kind of like the game of telephone you played as a kid. You started a message on one side of a long line of people and passed it on, one-to-another until it came out the other end. The result is usually hilarious. The ending message sounds nothing like the one you started. Market messages to indirect sales channels are just like that. What I wanted to know is what kind of reseller did they buy from? What product did they go into the store thinking they were going to buy? Was it the same one they left with? Finally, I also wanted to understand the resellers themselves. These were the people who had the face-to-face interaction with our customers. What did they think about our company? Our products? Was our compensation program good, great? Were they making enough money with us? Who did they think were buying our products? Who did they think our competitors were? At the end I had a three-page questionnaire that I timed in a practice session with one of my marketing people. I could get it done in twenty minutes. Now the question was would anyone care to give me those twenty minutes. With the questionnaire written I turned and stared at the cart full of registration cards. They were in shoeboxes arranged by month and year they were received. I figured that the newer ones were more relevant than those sent in years ago. I took a deep breath and plunged in. I grabbed 500 of the most recent cards, which were from the last four months, and I started calling. Quite honestly since few customers ever get “hi, how are you doing calls” directly from an executive at the company who sold them a product, I didn’t know what to expect. Would anyone take my call, would I get hung up on, would they answer this long list of questions? Three hours and ten customers later I was beginning to feel like this would work. It had taken about two registration cards to get one customer on the line. And out of those, 9 out of 10 were happy to talk to me. Actually happy is the wrong word. Stunned was more like it. They had never had anyone from any company, let alone a computer company call and ask them anything. Then when I told them I was actually the VP of Marketing they were flabbergasted. They were happy to give me everything I asked for and more. And then to their surprise I offered them either a SuperMac coffee cup or T-shirt for their troubles. Now I had happy and surprised customers walking around with paid advertising for my company. For the next three weeks I spent 8 hours a day calling customers and another 6 hours a day managing my new department. I’m sure the CEO thought I was crazy. But after three weeks and three hundred customer calls I was done. I had been to the mountaintop and had gotten the message. Market segment: While the company did have customers in a wide range of industries and businesses, the actual users were in a (then) new and emerging segment called color desktop publishing. 80%: In fact, over 80% of the customers who turned in their reg cards were in this group. This was a real eye-opener. No one in our company knew this. Now we could stop guessing about who our customers were. We could even go further and talk about how they worked and what they needed to be successful in their jobs. Performance: What these customers cared about more than anything was graphics performance in these four key applications. And by more than anything, I mean that the word performance came up time and again from these professionals. Waiting for images to move around the screen were not only driving them crazy, but costing them money. The bad news: That was the good news. The bad news is when I asked what had they heard about SuperMac, I got a litany of stories about the company going out of business, about how their dealers complained that they owed lots of money and that our ads were incomprehensible. More importantly, no one knew what business the company was in. “Aren’t you the cheap disk drive company?” This information coming from someone who had already bought our graphics boards. Gulp. Worse news: The worst news was that more than half of our customers had gone into their dealers to buy another brand of graphics board. And it had been the dealers who had convinced them to buy ours. (As we found out when we interviewed our dealers, our sales department was using extra commission payments – called Spif’s – to incentivize the channel to move our product.) The good news was that the Spif strategy was working; the bad news is that it was costing the company our entire profit. We were losing money on every board we sold. As it turned out, large companies that bought graphics card for their publishing departments didn’t always send registration cards back, so my survey was skewed to smaller groups. What did I learn so far?